"Our top pick goes to the Crusader flymask...We loved the thoughtful design that covered way down to the horse nostrils...The Crusader was our first choice. It's not the cheapest, but it's worth the money." The Cashel Crusader fly masks are made from a soft plastic coated mesh that blocks 70% of damaging UV rays. 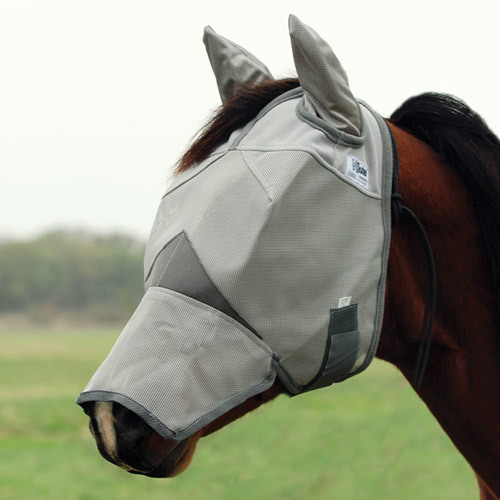 Light and white horses prone to sunburn can benefit from the long nose option model fly masks. Also with ears, the Cashel masks provide your horse with maximum protection from flies and mosquitoes. Spoil your horse with the number one rated fly mask; the safe alternative to toxic fly sprays. With its patented three hole cap that eliminates forelock damage and unique design that keeps the mesh well away from the eye area, your Crusader is the most comfortable mask available. Care directions: fasten Velcro straps together. Machine wash, line dry. Choosing a Size. Determining the size of your mask is easy. Just match it to your halter size. Gray mesh with black trim.